The geenhouse effect is the heating of the surface of a planet or moon due to the presence of an atmosphere containig gases that absorb and emit infrared radiation. 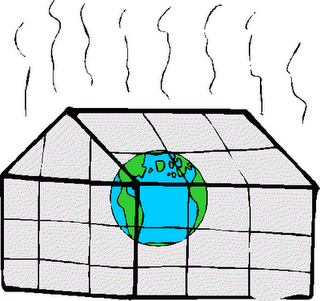 Thus, greenhouse gases trap heat within the surface-troposphere system. This mechanism is fundamentaly different from that of an actual greenhouse, which works by isolating warm air inside the structure so that heat is not lost by convection. 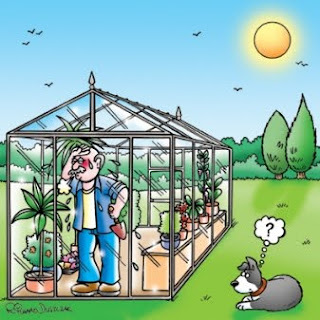 The greenhouse effect was discovered by Joseph Fourier in 1824, first realiby experiment on by John Tyndall in 1858, and first reported quantitatively by Svante Arrehnius in 1896. The black body temperature of the Earth is 5.5 °C. Since the Earth´s Surface reflects about 28% of incoming sunlight, the planet´s mean temperature would be far lower, about -18 or -19 °C. 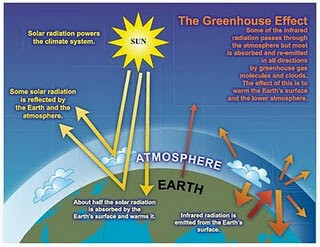 Along with the added contribution of the greenhouse effect, it is instead much higher, roughly 14 °C. Global warming, a recent warming of the Earth´s surface and lowe atmosphere, is believed to be the result of an "enhanced greenhouse effect" mostly due to human-produced increases in atmospheric greenhouse gases. This human induced part is referred to as atmospheric ghlobal warming. (AGW). Posted by Valentina at 5:22 a.m.
macris December 17, 2009 at 5:46 a.m.
i like your topic valen!! Gaby Cordova December 17, 2009 at 6:35 p.m.